One of my favorite memories of being at a water park was floating down the lazy river in an inner tube! So relaxing .... just laying there going with the flow of the current, no worries....just floating along until...of course...my boys would come up along side of me and start splashing and messing with my "inner peace" !! While at church yesterday...the subject of pursuing God everyday was brought up. Someone made the comment that if we weren't moving towards God each day...we were moving away from God. Now....because I am a very visual person and I love any thing that will help me grasp hold of a concept better...my ears perked up when someone used the analogy of floating down a river. Just like the lazy river at the water park....all you have to do is just sit in your inner tube and relax and the current of the river does all the work in moving you along. But...if you want to get to a certain destination that you have pasted by...you have to move against that current to reach it. Now stay with me here because this visual will blow your socks off !! Here it goes....the river represents the world in which we live. The current represents the things in this world , things in our daily lives (family, jobs, health issues, money issues, activities, friends and anything else that is apart of your daily living) and things that are happening outside our of homes (current events around the world). 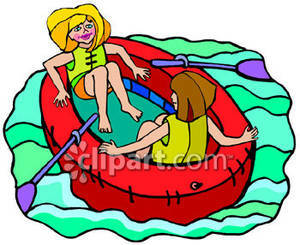 God is behind us as we are floating in our inner tubes. Can you see it yet? We have to intentionally turn around and work against the flow of the current in order to move towards God and keep our eyes on God. If we are not intentionally moving towards Him than due to the nature of the worlds current...we will automatically move with the current and that worldly current will move us away from staying close to God. This is just an analogy so lets not get to crazy with this....but I do want you to see how incredibly important it is to daily be INTENTION about your moving towards God. Let's not be fooled here my friends....this world can easily draw all of our energy, attention and efforts into it's grasp and we can lose our momentum with God. So, look at your day, your activities and see if you are just floating along your own lazy river, thinking to yourself that it's ok that you are not purposefully moving towards your God... or are you....like me....making an effort to move against the current of my daily hectic life towards God.